With My Needle: Introducing "Tell Me Ye Knowing"
Introducing "Tell Me Ye Knowing"
Today I'm very excited to show you my other new design, Tell Me Ye Knowing. I hope you like it. Although the verse on this sampler is a very old one that was often used, I've been unable to find the source. I've also checked with several sampler researchers, and they also can't find the source either. Please let me know if you know something about it. The stitch count is 231 wide x 231 high. The stitches used are backstitch, cross stitch, and four-sided stitch. Stitch diagrams are provided. 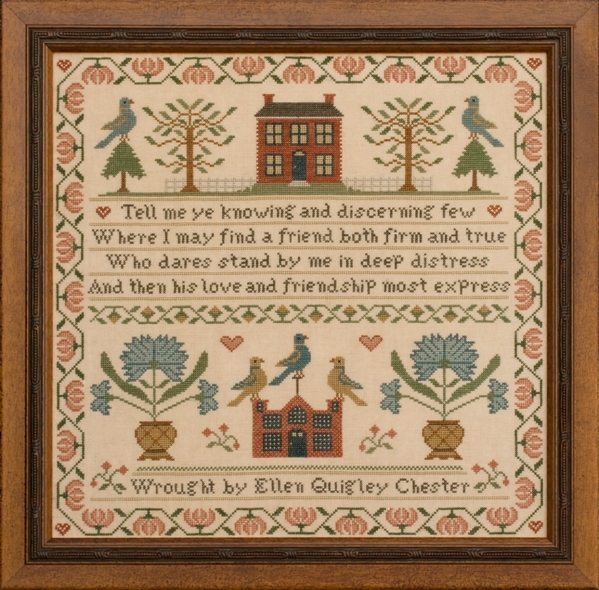 This sampler can be stitched on linen or aida. I'll be sending the charts for my new designs to the shops on my automatic shipment program next week so if you're interested you can ask your favorite shop about this sampler and also Mini Quaker Samplings that I showed you yesterday. The shops on my automatic are marked on the shop page of my website. I hope you're enjoying your weekend and can find some time to stitch, even if it is just for a little bit. It's a beautiful sampler Ellen! This is beautiful Ellen and I love that verse. I have not seen it previously. Oh Ellen, All f your new works are just beautiful!!!!! I love them ALL!!!!! Beautiful new sampler and I love the verse. 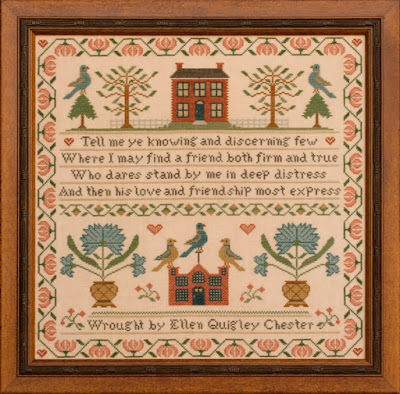 I stitched a reproduction sampler honoring Queen Charlotte, consort of George III, dated 1765 with that verse. It's beautiful, Ellen! The colors are wonderful, as is the verse. Ellen, another wonderful chart!! Thank you so much for your efforts! Congratulations on a beautiful design. The verse is touching and I would very much like to add it to my collection. Do you have a UK stockist?